Have You Read This Book About the Genesis "Days?" I was recently discussing this book with K - think he's still working on it. It's key premise is that, for all of the YEC / OEC creation time wars over the length of the creation "day" ("yom" in Hebrew) lengths of time in Genesis, Moses' focus wasn't to give the pre-scientific age Israelites correct SCIENCE (sun/earth/moon) explanations, but was instead meant to correct their 400+ years of ancient Egyptian and Mesopotamian creation myths. Miller asserts that God was using Moses text to correct early Israel's false theological understandings - in which, as opposed to the many false Egyptian gods who were supposed to be part of the creation - that Yahweh, the ONE true God, stood outside of, created, and controlled the creation. Of course, how the Genesis 1 text is worded, also fits the day / age understandings of old earth creationists (OECs) while doing so. This book has been referenced here by me quite a lot. I'm just wondering how many of you have now read it, and if so, what is your opinion of it? Personally, I think you can isolate any one aspect of what it's saying and carry it to an extreme. But it certainly can't be an accident that Moses chose such similar wordings and sequences to the ancient mythology Israel had absorbed during its four centuries of Egyptian captivity. As while Moses would have been very aware of such myths, one would think he would have otherwise taking extreme care to not use language that in any way resembled what those myths assert. Re: Have You Read This Book About the Genesis "Days?" Moses' focus wasn't to give the pre-scientific age Israelites correct SCIENCE (sun/earth/moon) explanations, but was instead meant to correct their 400+ years of ancient Egyptian and Mesopotamian creation myths. God's intent was for correcting their 400+ years of ancient Egyptian and Mesopotamian creation myths... setting the record strait. We, modern intellectual Christians interpret the bible from a modern view point and not as how the ancient folks world view thus much of the symbolism used in the bible and prophecy is lost such as taking the supernatural out of the bible in exchange for man's reason as supreme measure of spiritual matters In doing so what we have is the fulfillment of what Roman 13:13ESV happening - quarreling and jealousy rules and not stopping it. Every evil work runs rife in churches is the result. Rom 11:33-36 ESV, "Oh, the depth of the riches and wisdom and knowledge of God! How unsearchable are his judgments and how inscrutable his ways! 34 "For who has known the mind of the Lord, or who has been his counselor?" 35 "Or who has given a gift to him that he might be repaid?" 36 For from him and through him and to him are all things. To him be glory forever. Amen." And YET, amazingly, the way Genesis 1 is worded, it works on two very different but complementary levels. Yes, it was correcting the false pagan myths absorbed by a pre-scientific-age people. But the sequence is also correct and the verbiage works perfectly to fit a day/age understanding. Which shouldn't be unexpected, as when God inspired Moses what to write, He always perfectly foreknew the entirety of the collective audience that would study his words, across time. God always knew that moderns in the scientific age, its scientists exceptionally focused upon studying His other testimony - the Creation itself - would also read those very same words. God didn't just design the wording for the ancient audience. It's just that the original audience had not the tools or modern textual and scientific understandings that we today have. Just as some of what is written about the end times and the Book of Revelation are difficult for us to currently understand the specifics and exact timing of when and how those events will go down. But to the audience alive when it does, the clarity and understandings will begin to make total sense. I haven't read that particular book. 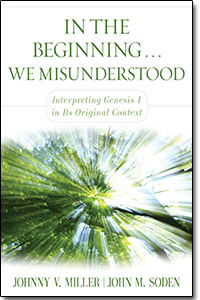 I'm still working through the issue of what Genesis 1 meant to the original audience. Ancient Israel definitely had a different understanding of cosmology than our current scientific view, so I agree we cannot impose a modern understanding of cosmology upon the original audience of Genesis 1. So far my primary sources of information regarding the ANE understanding of Genesis 1 have been John Walton and Michael Heiser. I am still mulling over the premise John Walton proposes in his book "The Lost World of Genesis One"
The position that I have proposed regarding Genesis 1 may be designated the cosmic temple inauguration view. This label picks up the most important aspect of the view: that the cosmos is being given given its functions as God's temple, where he has taken up his residence and from where he runs the cosmos. This world is his headquarters. The most distinguishing feature of this view is the suggestion that, as in the rest of the ancient world, the Israelites were much more attuned to the functions of the cosmos than to the material of the cosmos... As a result, Genesis 1 has been presented as an account of functional origins rather than an account of material origins. - The Hebrew word translated "create" (bara) concerns assigning functions. - The first three days pertain to the three major functions of life: time, weather, food. - Days four to six pertain to functionaries in the cosmos being assigned their roles and spheres. - The recurring comment that "it is good" refers to functionality (relative to people). - The temple aspect is evident in the climax of day seven when God rests -- an activity in a temple. The account can then be seen to be a seven-day inauguration of the cosmic temple, setting up its functions for the benefit of humanity, with God dwelling in relationship with his creatures. BTW... I found and listened to this interview with John Soden about his book on YouTube this morning.